Und wie üblich - eine Vielzahl weiterer kleinerer Verbesserungen und Bugfixes. Es gibt auch viele neue stark gescriptete Missionen einschließlich RPG-Abenteuer, Multiplayer-Genossenschafts Belagerungen und sogar ein Snake-Klon. Vielen Dank an alle, die zu diesem Update über Beta-Test, Karte machen, Scripting, Programmierung, Fehlerberichte beigetragen hat, die Übersetzung oder die Spende. Und dank der gesamte Knights and Merchants Community für lebendig und stark zu halten, das Spiel nach all den Jahren. Dieser Beitrag wurde unter Nachrichten veröffentlicht, Veröffentlichungen veröffentlicht. Setze ein Lesezeichen auf den Permalink. Thank you Lewin and Krom for all the time and effort put into this. are there any servers up for the update? Or doesnt that matter. thanks you guys, keep going good work ! Thanks for your great work on this great game! Heel mooi werk jongens, geweldig! Een vraag: Is het mogelijk om geregistreerd verder te gaan met namen? Nu kunnen bijv trolls oneindig door irritant doen. Player accounts and registration is a huge amount of planning and work, I’m not sure if and when we can do that. NICE JOB !!! Amazing !!!!! I LOVE THIS GUYS !!! Ich werde die Version gleich mal ausprobieren. Ich hätte da noch ein Vorschlag zu machen. Die Steinwege kann man die auch irgendwie löschen oder ersetzen falls man zb. dort umbauen will und eine Getreidefarm, oder anderes machen will? I’ll be the version out for a spin. I would have still to make a suggestion. The stone paths, you can also delete or replace if you for example anyway. wants to rebuild there and wants to make a grain farm, or else? On screen enemy got army in village, will he build army and attack us with it? Yes, the standalone AI will build an army and attack 🙂 A few AIs should now be a strong opponent for moderately skilled players. Try one of the singleplayer missions from the original game like Across the Desert, Wilderness or Border Rivers. Or add some AIs to a multiplayer lobby and select a building map. There have been so many improvements to the AI since r5503 that I look forward to see how quickly I can beat missions in the TSK campaign in this version! Krom and Lewin, I hope that you guys will benefit from taking on this project even more than you currently anticipate! thanks a lot, but i have problem with it. After update to R6720, in my campain, i have all missions locked. I want to continue in campains, not to start from begining. Can somebody help me, how to unlock it? Campaign progress is stored in Saves\campaign.dat if I remember correctly. You need to carry over that file from your previous installation path to the new one. Hey! Thx for the great work on this game! Savegames are incompatible, that’s right. Campaign.dat should have worked. Maybe you have used a different path? Try searching for campaign.dat on your disk C: – Win could have placed it into a different folder under your user name path. You can use cheats to skip past missions though. Press F11 on the keyboard, then Debug -> Debug Cheats. Now you can press “V” to win the current mission. Use that to skip to the mission you were up to. When you finished turn off debug cheats and press F11 to hide the overlay so you don’t accidentally press one of the cheat shortcuts while playing. I accidentally found this fantastic patch. Thank you. Very nice work guys, thank you very much for the time that you spend to do this new relase! I cannot install kam remake, I get the message that the peasants’ rebellion is not installed although it is installed, can you help me? Nothing has changed. KaM Remake verifies you have license copy of TPR installed as it was before. Maybe reinstalling your copy of TPR will help, in case it’s credentials got corrupt/lost. Great game I must say, but in this release I have some problems I didn’t encounter in r5503. First: When I start game I have visible taskbar at bottom of the screen, and it prevents me to scrool map by putting mouse at edges of screen. I can either change in resolution form “fullscreen” to “window” and back to “fullscreen”, or I can go to the list of authors and click on links, to activate my browser and then activate KaM Remake, and it finally works in true fullscreen, but this is bothersome. The second problem was when I tried to load game from main menu saves weren’t showing but instead error appeared. But I changed my WineHQ options from Windows 7 to Windows XP and now it works ok! – If anyone has this second problem of mine try doing as I did. (However in r5503 there was no such problem). I have Linux Mint 17 with WineHQ 1.6.2. I’m not sure why that error might be occurring, it’s hard to tell with Wine. Alt-Tab might be enough to fix the taskbar. My only other suggestion is to keep changing the Wine settings to see if that improves it. Ohh! This is really amazing! Thank you so much!! Since i first played Kam Remake you have made so much development! I’m verry proud on you guys moderating this game, and the fact that you still spend your time on this. Hey i have a Problem with the new update… When i downloaded and installed the new update i can not start KAM REMAKE .. Try reinstalling the game and make sure you have latest antivirus software installed and check your PC for viruses. Google search for Error 216 says it could be a trojan. The update is great! Thanks! I am really going to enjoy playing this game without getting out of sink every minute. That’s great update.. multiplayer with friends against AI’s is simply fantastic. WHAT TO DO, when i killed ALL ENEMIES IN 1ST MISSION OF CAMPAIGN ”BROKEN KINGDOM”?? Does anybody have the same problem that he killed that ”unkilledable” wave of enemies? Which campaign are you referring to? The original campaign “The Shattered Kingdom” or the new fan-made campaign “An Empire Destroyed?”. With An Empire Destroyed, you are supposed to be defeated in the first battle in order to progress. zaktualizowałem wersję Remake z r5503 do r6720. Nie działają mi żadne save`y (niewspierana wersja r5503). Da radę je uruchomić na tej nowej wersji? Saves are not compatible between updates, sorry. You can reinstall the old version (from Download Archives) to a different folder and copy the “Saves” folder there to continue playing them in the old version. Dear, Levin, help me, new release “War and Peace”, it only needs to buy? and then I downloaded Mirrors and copies of the new release and during installation, it was necessary to have release: peasant uprising, I would sradostyu prioprel, because very hunt to play this wonderful game, but now strained with the money and can not buy. And without release: peasant uprising, vozmozhno whether to install a new release of “War and Peace” Kam Remak r6720? Thanks in advance. Happy New Year to you and all the best to you. Hi guys, first of all, your work is really amazing! This last update was the one I was waiting more eager!! AI updates are fantastic, and I see many other people were waiting for this too! – Mission 8 was reeeeeally hard, the first atack was almost impossible to defend. I searched around the foruns and found about distracting some units with an archer. I don’t think abusing AI should be the right way to win, however. I did it, but from there it became so easy I couldn’t believe. – Mission 9 was very easy, my biggest problem was space to build, but they almost didn’t atack me. 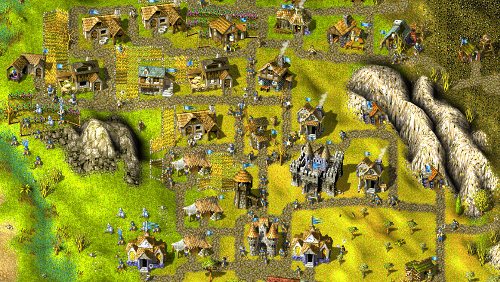 Also I could destroy most towers/buildings with xbows without they coming to defend, unless I atacked some serfs and units in the city. – I also found old posts about market in campaign, u saying that it could be added from mission around 7-9. I’m at 11 now, did u implement it on any campaign? Missions are too hard.. and he gives every time a error if Im playing a mission.. Which specific missions are too hard? Can you post the error message so we can investigate it? Thanks. I think mission 20 in TSK is too hard. i tried at least 20 times, but I lose every time. some advice? How can i download new maps and campaings for KaM Remake? If you press the FAQ button at the top there are instructions for how to install them. How do I add Traditional Chinese language? Świetna gra! Szkoda że nie ma na Google Play lub APP Store. In the newest release, the script of the 7th mission of Vas’ campaign Federation of Nehryn isn’t working correctly. The initial attack should attempt simultaneously but instead, the west side was attacked and the east side wasn’t. The enemy kept attacking the allied village. And the allied barbarians went on suicide mission at a certain point. The base can’t be defended as a group of horsemen (from the not working assault on the east side at the beginning, I assume) storm it right after and slaughter the xbowmen. As I do’t know if the fault has to be fixed by the remake creators or by the campaign builder, please inform whoever feels able to fix it. Thank you. I don’t know if the remake made it worse, but the light brown enemy (in the north) in the 8. TSK mission is even more stuck than in the basic game. Can you optimise his city a bit. In the last playthroughs some of his units died because of being unable to reach the taverne or the storehouse and they have 2 of each. Described in one word: Chaos. Can i play fast forwarded in the KAM Remake? Or if i use the fast forward function will it ruin the game like in the previous versions? Fast-Forward never ruined the KaM Remake like it did with TPR. The difference is that in TPR FF function broke the games logic by skipping ticks. But KaM Remake FF function is “honest”, it never skips a game logic tick. You can use F5-F6-F7-F8 to change the game speed to x1-x3-x6-x10 accordingly. ok guys, i love this game, and i love what your doing with the remake. however, i have 1 small issue. i have a copy of KaM historical version from steam. however, when i try to runt he remake installer, it insists that i do not hav a copy of Kam PR. PR is included in the historical version. so either im doing something wrong, or your installer dosent recignize the steam verson…. Did you run the KaM version from Steam at least once before trying to install the KaM Remake? yes. even tried running the launcher from the K&M folder. still no dice. i have noticed though, at 1 time i had a regulart copy of K&M TPR and it had 2 separate launchers, 1 for SK and 1 for TPR, steam however, has 1 launcher labled TPR which you can access SK and TPR from. not sure if this would make a difference though. and ty for the Quick responce. See if you can uninstall everything KaM related and try it once again from scratch by the guide. I don’t have other ideas for – never met such a bug yet. Still will not work. i even tried renameing the shortcut so that is says ‘knights and merchants the peasants rebellion. that didnt work either. well, i still cannot get the installer to recognize the steam version. That’s strange, nobody else has reported this problem. I have the Steam version of KaM and the KaM Remake installer detects it correctly. Just to check you have the same version: When you launch KaM from steam does it give you this option to choose which version? – Next, launch Knights and Merchants from inside Steam (select “Play Knights and Merchants” not “HD Version”, and exit once you reach the menu. I tried that here and it created the correct files and registry entries for KaM Remake to detect it. If it still doesn’t work for you I have some other ideas to try. ok so, i always play the reg version on steem, not the HD version. ive redownloaded the installer for remake everytime i tried. iv tried uninstalling and reinstalling K&M on steam, ive launched the game, and verified files. and i still get the same notice. i think perhaps this evening i will try reinstalling the game to my main partition and see if that helps. it shoulsne be an issues as steam is indexed corectly but w/e. ok so.. the issue was that i had steam installed in a separate partition. due to that, the launcher couldnt detect the game. so i uninstalled the game, and reinstalled it to the main partition, launched the game, also installed a shortcut to desktop for good measure, and the installer for remake started working. go figure lol. so for w/e reason it wouldnt detect it on a separate partiton on the same harddrive, even though its indexed. which is odd, as thats the first time ive ever had an issue with an installer not being able to detect something in a separate partition. That’s strange, I have Steam installed on different drive and it works fine for me, so I guess it’s only a problem for different partitions on the same drive. I’ll keep that suggestion in mind in case somebody else has the same problem. Hi guys, my wife loves the game and is trying to play the multiplayer mode but is having some difficulty. I have tried installing the remake however it does not seem to recognise that the original game is installed via steam. I have launched the game a couple of times and also tried the solution that has previously been given – verifying the game cache. It still doesn’t recognise that the original game is installed. I was wondering if we have installed the wrong version of the original game? When I launch the game I am not given the option between ‘Play Knights and Merchants’ or ‘HD version’ the game just launches without asking any questions. Hi, sorry to hear you are having trouble installing KaM Remake. It sounds like you have a different version of KaM on Steam, my one still offers HD/normal. Do you have your steam games installed on a secondary partition/drive? That fixed it for griede (see the comments above) although I’m not sure why. Unfortunately not, everything is installed on the same hard drive. Are there any other solutions you could suggest? THANKS VERY GOOD.I LIKES THIS GAME. I really like KaM since i was a kid. This remake is awesome! Will there be a bigger update in the near future ? We don’t have plans for an update in the near future. You can read about our view on the town hall on the FAQ page of this site. Just wanna say that the AI is now a real challenge, love it because I have to think about new strategies and that is what I like so much. By the way, was playing TSK campagne mission 8, can’t manage to survive the wave of barbarians in the beginning, started to think that they might be overpowered against my armies of Axefighters (15 and 12) and Bowmen (20). Or my strategy doesn’t work, that’s an option too. Any suggestion about this anyone? Never mind, I was overlooking the forum link. Thanks again for this wonderful Remake!